Click on a region to see the recommended websites. 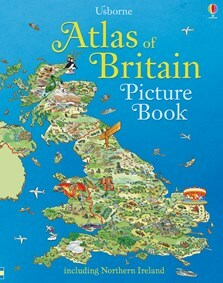 An illustrated, fact-filled atlas showing the most interesting sights across Britain and Northern Ireland, from world famous attractions to local festivals, activities and animal life. Each double page shows a different region, with key geographic and historic features and towns plus a list of things to spot. Includes a contents list and index, and internet links to further information and ideas for things to do in each region, available via the Usborne Quicklinks website.